Mathews, Mayan writer-historian Carlos Armando Dzul, Caleigh Prewitt, Billy Klaess and Alyssa Gonzalez discuss the Mayan Holocaust of 1562, carried out by Spanish authorities. Four TCU Spanish students spent fall break near the resorts of Cancún and Cozumel, but instead of relaxing on the beach, they met with authors whose work they had been studying in Spanish and Hispanic Studies Professor Donald Frischmann’s Contemporary Indigenous Mexican Literature course. Frischmann spent the first seven months of 2013 in the Yucatán peninsula translating regional literature from Mayan and Spanish thanks to a Fulbright research grant. When he outlined plans for his fall indigenous literature course, he decided to offer an optional excursion to the Yucatán and Quintana Roo states so that students could experience firsthand the realities of contemporary Mayan life. In class, students read Día Sin Mancha by Sol Ceh Moo and poetry by Wildernain Villegas Carrillo and Martiniano Pérez Angulo. Through the works, students built a foundational understanding of Mayan customs, cosmology and challenges. Upon meeting Sol Ceh Moo over breakfast, they learned more about the racism against the Mayans and the limited opportunities for many young people, especially women, in the area. The students then traveled to the Intercultural Mayan University of Quintana Roo in the town of José María Morelos, where Frischmann had been doing his Fulbright research. He calls the town “storybook” and explains how it is one of the safest places in Mexico. The professor had purchased a small piece of land in José María Morelos, and during the trip, poet Wildernain Villegas, who is studying to become a traditional Mayan priest, lit candles, burned incense and performed a ceremony to honor the Earth. Preserving Mayan culture in an increasingly globalized world is important to indigenous people in the Yucatán. The task, however, can be difficult in light of the outmigration, mainly to the United States’ Pacific Northwest, and due to the desires of many young Mayans to move to the nearby beach resorts to work in tourism. On the trip, students visited the ruins in Uxmal, which was a large and important town between the fourth and seventh centuries. They also visited Maní, the site of the Mayan Holocaust at the hands of the Spanish invaders in 1562. The students did get to kick back for a few hours on the beach in Tulum, where they sampled vaporcitos, tamale-like corn dishes, and the regional agua de chaya drink. In José María Morelos, they befriended several university students and were able to practice their proficient Spanish skills in a real-world environment. 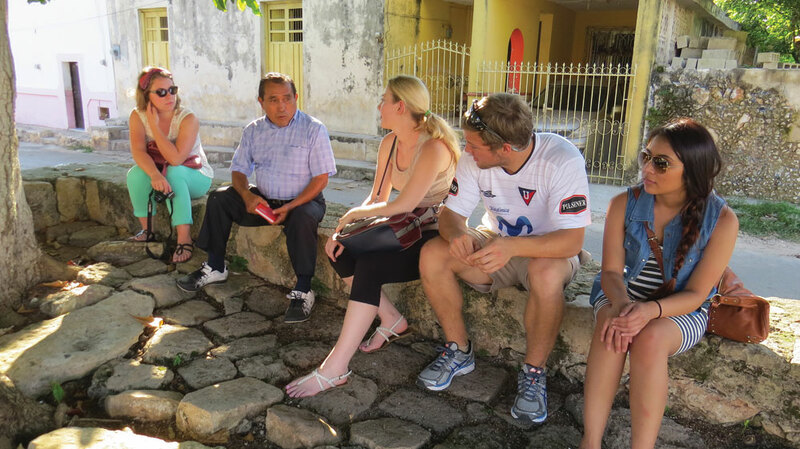 Frischmann has been traveling and making friends in the Yucatán area for nearly 30 years, and he appreciated the opportunity to introduce TCU students to the land of the Mayans outside of the glitzy resorts.